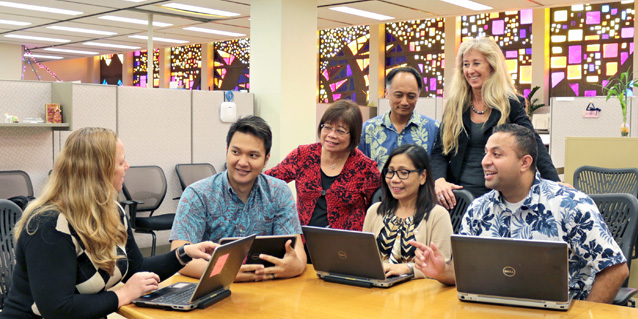 HONOLULU – The State took a major step in modernizing its payroll system when the first group of State employees was paid on May 4 through the new PeopleSoft-based software system. About 1,300 employees from the Department of Accounting and General Services (DAGS) and the Department of Human Resources Development (DHRD) were the first of three groups to receive paychecks through the new system. The new payroll system replaces a 50-year-old paper-based, highly manual collection of processes created in the late 1960’s that has limited capability to distribute pay to banks and credit unions. The new system is computer-based, using the industry best practice of an automated clearinghouse (ACH) that allows for electronic direct deposit to financial institutions anywhere in the U.S. This modernization project addresses one of Gov. David Ige’s top priorities, which is to make government more efficient. Two more groups of employees will transition to the modernized system in the coming months. Group two – consisting of about 20,000 employees from remaining departments, agencies and jurisdictions – will changeover in July/August. Group three – consisting of about 55,000 employees from the Department of Education and the University of Hawai‘i System – will transition in October/November. The first group of State payroll and human resources personnel staff tested and trained on the new system over the last three months in preparation for its deployment. With an up-to-date program, staff can use technology to process information more efficiently, providing more time to work on other priority items. Under the new system, features will be rolled out throughout 2018 for employees to be able to manage their payroll information online, including updating direct deposit information, federal and tax withholding allowances, mailing addresses and emergency contact information, as well as viewing and printing pay statements and W-2 tax forms. Employees are being supported and informed of the new system through a service center, letters, emails, presentations and other communications. The project is being implemented by DAGS in coordination with the Office of Enterprise Technology Services. The consultant hired in June 2016 to work on the project is CherryRoad Technologies, Inc., with a contract for $37.6 million for the implementation and maintenance of the payroll system and the time and attendance system for state’s 75,000-plus employees. The implementation of the payroll project is on schedule and set to be completed by Dec. 2018.